Last evening, the Women’s Professional Billiard Association inducted Jeanette Lee, known throughout the world as “The Black Widow,” into its Hall of Fame, just prior to the start of this weekend’s WPBA Masters at the Soaring Eagle Casino in Mt. Pleasant, Mich. Lee, who has won over 30 national and international titles, is currently ranked No. 3 on the WPBA points list. Taking the sport by storm in the mid-’90s, Lee best year came in 1998 when she was named WPBA Sportsperson of the Year and BD Player of the Year. In 2001, Lee was crowned as the World Games Gold Medalist and continued her success in 2003 by clenching the Tournament of Champions title. As she accumulated tournament victories, Lee quickly ascended to No. 1 in the world. As the most recognized face in billiards, Lee has been consistently ranked as one of the most powerful people in the sport by Billiards Digest. Lee is currently working to reclaim her rank as the No. 1 billiards player in the world, all while raising a family of six with her husband, George Breedlove, near Indianapolis, Ind. Taiwanese billiard superstar Jennifer Chen is reportedly missing and believed to be hiding from gangsters after running up enormous gambling debts. Asian TV and print media have been buzzing about Chen’s disappearance since early August, reporting that the 31-year-old WPBA pro allegedly had lost as much as $600,000 gambling on Taiwanese and U.S. baseball, and the 2006 World Cup. Reports of her whereabouts have varied, with some claiming she has gone into hiding in Hong Kong, and others claiming she has fled to the U.S.
It’s a case with the whiff of the sensational in Taiwan, where the photogenic Chen has long been a celebrity as a pool player, sports broadcaster and actress. According to a report in the Aug. 13 edition of the Taipei Times, prosecutors in a related case involving a gambling ring were able to gather intelligence on Chen’s gambling debts. Allegedly, gangsters met with Chen on July 24 and demanded that she give up her Taipei residence in order to cover the debts, the Times reported. Chen went missing soon after the meeting. WPBA officials have not heard from Chen since mid-June, according to tour director Peg Ledman. 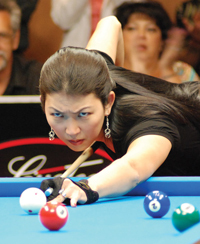 Chen did not compete in the WPBA’s Florida Classic in late June, nor the Midwest Classic, held July 27-30 in East Peoria, Ill., dropping her ranking to 19th. Chen told Ledman in mid-May that she did not intend to play in the two events, and that she instead would be working with an acting coach, the tour director said. Their last contact was in mid-June, when Chen confirmed via telephone that she would not attend the Florida Classic. Chen won a bronze medal in billiards at the 2001 World Games and a silver medal at the 2005 World Games. No, we’re not talking about the risque rapper who was recently released from prison, but Women’s Professional Billiard Association stars Melissa Little and Ga Young Kim, who are teaming up to perform pool exhibitions in three states. Kim, a two-time world champion and U.S. Open champion, and Little, a two-time Colorado State champ with 18 top 10 finishes on the WPBA, are offering free admission to the events. The pros will play each other in a pool match, have a Q & A session with the audience, and then proceeded with an autograph session. The tour will kick off from 7-9 p.m. on Monday, July 31 at Big Dog Billiards in Des Moines, Iowa. For more information on this event, contact Randy at (515)262-6523. The duo will then head to Gibbys Sports Bar in Grand Island, Nebraska, where they will perform on Tuesday, Aug. 1 from 7-9 p.m. For more information on this event, contact Tom at (308) 382-9744. Their final stop will take place from 7-10 p.m. Wednesday, Aug. 2 at Little’s sponsor site, The Wynkoop Brewing Company in Denver, Colorado. For more information, call The Wynkoop at (303) 297-2700. Karen Corr was beaming upon winning her second consecutive Cuetec Cues Florida Classic, the fourth stop on the 2006 Women’s Professional Billiards Classic Tour held at the Hard Rock Casino in Hollywood, Fla. She defeated Allison Fisher in the final by a score of 7-4. Corr came through the bracket unscathed, with wins over Liz Ford, 9-3, Dawn Hopkins, 9-2, Tracie Hines, 9-5, and Sarah Ellerby, 9-2, to land in the top 16. At that point, the format switched to single elimination and the players drew an opponent at random. Corr was matched with Gerda Hoftstatter, who she beat 9-4, to land in the semifinal against Jeanette Lee, while Fisher faced Monica Webb after a solid win over Tiffany Nelson, 9-4. In the match against Lee, Corr pulled ahead 6-2, but Lee’s focus would not falter. She came back, 6-5, at which point Corr showed concern, but swiped back control for the 7-5 win. In the other semifinal match, Webb was visibly frustrated by some bad rolls and soon fell behind in the match. She would have to settle for tied-for-third place, as Fisher won it, 7-3, to stage the ever-familiar face-off of the No. 1 and No. 2-ranked WPBA players. As always, it was an intense match and both players often found themselves playing safe, but Corr came out on top, 7-4. The Women’s Professional Billiard Association’s fourth stop on the Classic Tour, the Cuetec Cues Florida Open, begins tomorrow, June 29, at the Hard Rock Hotel and Casino in Hollywood, Fla.
Last year No. 2-ranked Karen Corr defeated No. 1-ranked Allison Fisher, as well as Monica Webb and Ga-Young Kim to win her first title in 2005. Check out http://www.wpba.com/, which will have regular result updates, to see if she can defend her title. Day two of the Enjoypool.com 9-Ball Championship was full of excitement at the Riviera Hotel and Casino in Las Vegas, Nev. In what many fans are calling the best match they’ve ever witnessed, Efren “The Magician” Reyes would not succumb to a 10-1 deficit to Allen Hopkins, who was playing near flawless pool. In the case match, Hopkins jarred the 8-ball, allowing Reyes back to the table. This would prove a fatal mistake, as Reyes strung together a 10-game comeback to win the match 11-10. Also on the men’s side, Taipei’s Po Cheng Kuo knocked crowd favorite Tony Robles to the one-loss side, 11-8. Kuo will next face Johnny Archer who scored an 11-0 win over John Schmidt on Monday. The women’s side had its share of excitement as well, as Arizona’s Angel Paglia upset Karen Corr, ranked second in the Women’s Professional Billiard Association, with a 9-7 win. Another non-WPBA player, Jasmin Ouschan, scored a hill-hill win over former World Champion Ga-Young Kim. Ouschan went on to score a 9-2 win over Alice Rim later on Monday. Chinese up-and-comer Xiao-Ting Pan continued to make waves with her impressive play, scoring a 9-6 win over Jeanette Lee. Gerda Hofstatter, ninth-ranked player in the Women’s Professional Billiard Association and member of the International Pool Tour, graduated from the prestigious New York University on May 11. Hoftstatter, who is originally from Austria, studied business, specifically leadership and management. She graduated with honors and now holds a bachelor’s of science degree. Ellen Van Buren played her first professional event in 1976, finishing third in the World Open. On April 22, 2006, 30 years later, Van Buren achieved the goal she has been working towards since 2003, becoming a touring professional in the Women’s Professional Billiard Association, and making history on the way, as the oldest female ever to earn this sought-after distinction. While Van Buren had her first taste of victory at the ripe old age of 17, she gave up professional pool to follow a more conventional path. “I really just thought the girls must not have played very good. I didn’t know. So I quit, I did school, I did career, and then I retired when I was 43. I had started playing pool again a couple years before that, so I actually came back to the game when I was 41. Two years later, I decided to try and make it here on the WPBA,” she said. Check out Van Buren’s “player diary” at www.wpba.com.